Sports in fact is a fair ability competition reflecting the health, fitness, zeal and perseverance of a race and the unity of a nation. Because of its powers to capture the people’s hearts, raise the nationalistic spirit to improve the country’s image and the national prestige, and foster the firm winning spirit every global country is further improving its sports standard with serious encouragement through national movement, said Commander-in-Chief of Defence Services Senior General Min Aung Hlaing at the ceremony to honour medal winners in the 29th Southeast Asian Games and 26th ASEAN Armies Rifle Meet (AARM) who have brought honour to the country and the Tatmadaw and coaches held at Bayintnaung Villa here this morning. Present on the occasion together with the Senior General were wife Daw Kyu Kyu Hla, Deputy Commander-in-Chief of Defence Services Commander-in-Chief (Army) Vice-Senior General Soe Win and wife Daw Than Than Nwe, Union ministers Lt-Gen Kyaw Swe and wife and Lt-Gen Sein Win, the Chief of the General Staff (Army, Navy, and Air), the Commander-in-Chief (Air) and wife, senior military officers of the Office of the Commander-in-Chief and their wives, the commander of Nay Pyi Taw Command and wife, coaches and the medal winners. 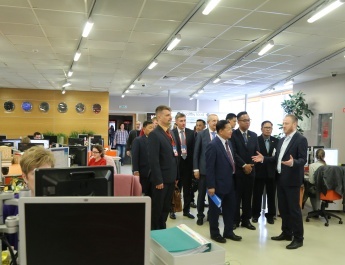 The Senior General in his address said the global countries in raising their national sports standard are making all-out efforts to show their sporting ability in the regional and international games through the internal competitions. They are also prioritizing the sports as a national movement. Based on the nature of each sport event individual skill is important and collective skill is also required. Technique is important in every sport event and training and experience is a requisite to become skillful in it. Moreover, collective assistance, encouragement and support for athletes are also vital. These basic factors are not only for sports but also necessary for a nation and an organization. As regards the emergence of a national level sportsperson, the Senior General said systematic preparations are needed as skill cannot be achieved in a very short time. It takes time and efforts to have fitness, strength and stamina while advanced techniques are also a requisite. So every sports event should have a fitness coach and a technical coach without fail. There must be a long-term nourishment process. As our foreign rivals will be undergoing the same process, we need greater fitness and better techniques. Only then will we achieve success. Athletes must try to render a helping hand to the new generation. Moreover, there must be support and programs for ensuring a better future for athletes who totally put all their time and energy in the sports. 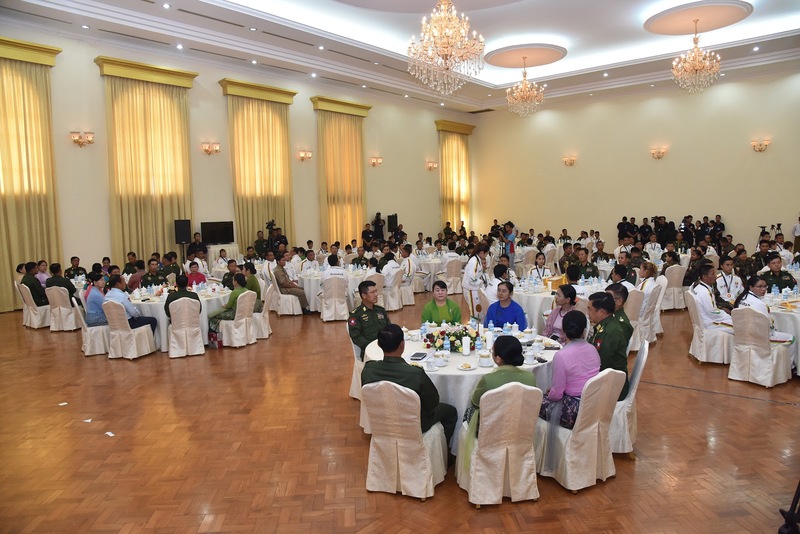 The Tatmadaw will provide support and encouragement for further development of the sports sector. 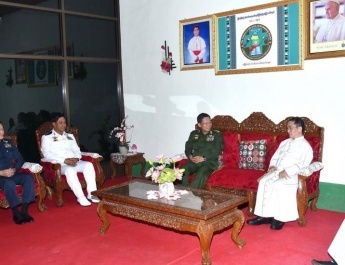 The Senior General went on to say that Myanmars have been fit and healthy, spiritually strong and united since historical times. Myanmar took part with dignity and won many medals in the World Olympic Games, Asian Olympic Games and Asian level sports meets. Although Myanmar has not reached the global level it is standing tall in the region. 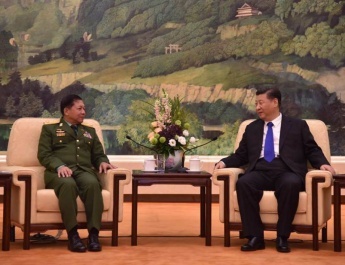 The Senior General then explained Myanmar sports history saying that the country was the largest medal winner or at the higher levels in Southeast Asia Peninsula Games which started in 1959; and that it stood second in the medal winning table of the 27th SEA Games. The Senior General said all must make collective efforts to raise the national sports level as sports victory reflects the prestige of the nation and the people and the nation’s development level. 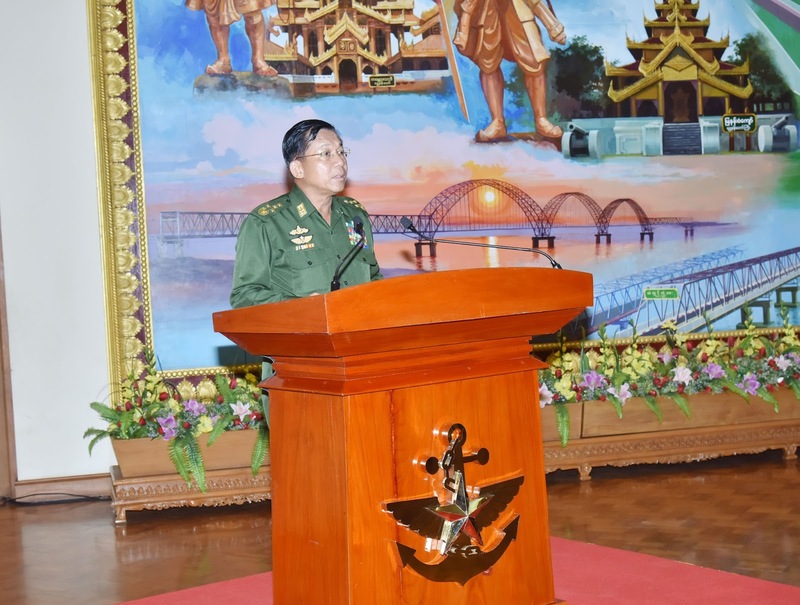 Every Tatmadaw member needs to be fit and healthy to be able to shoulder national defence duties to the best of their ability with physical and mental capabilities. So, emphasis is being placed on sports and games related to gymnastic exercise. The success of Myanmar’s sports history goes together with the performances of Tatmadaw athletes. When Myanmar was ranked second in the 27th SEA Games in 2013, the sport contingents included 163 Tatmadaw athletes, 58 of whom won medals. In this latest 29th SEA Games also, Myanmar won seven golds, 10 silvers and 20 bronzes totalling 37. Among them, 10 were achieved by Tatmadaw athletes—two golds, four silvers and four bronzes. 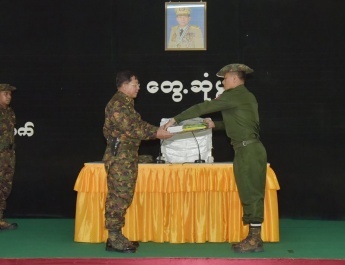 Similarly, in ASEAN Armies Rifle Meet (AARM), the Myanmar Tatmadaw team stood fourth. 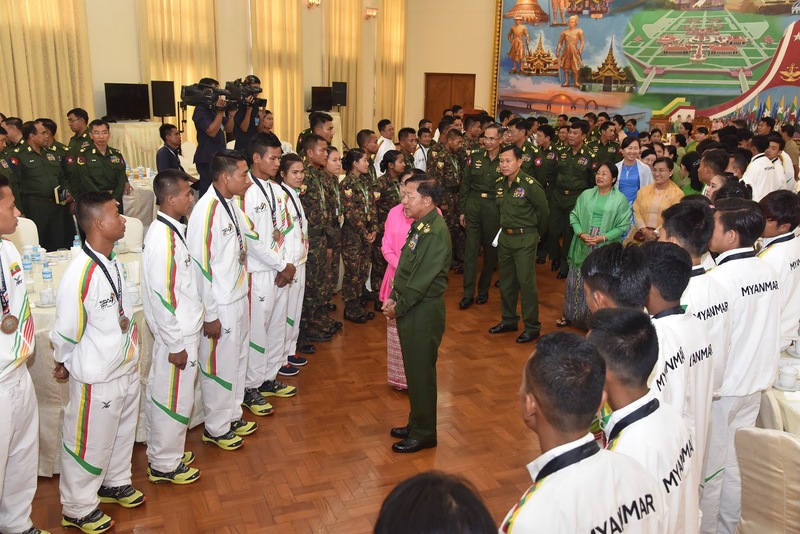 Those athletes who brought honour to the State and the Tatmadaw trained very hard with perseverance and unyielding spirit in order to win medals by showing their skills in the international community. 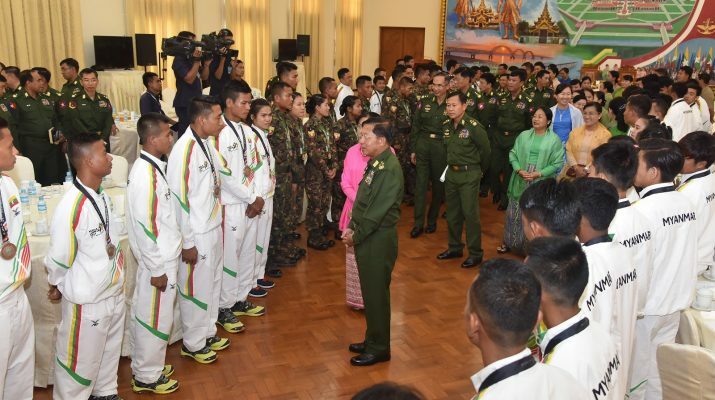 So, the Tatmadaw herby deservingly honours those victorious athletes and coaches as they practically showed their strong patriotism and nationalism, said the Senior General. 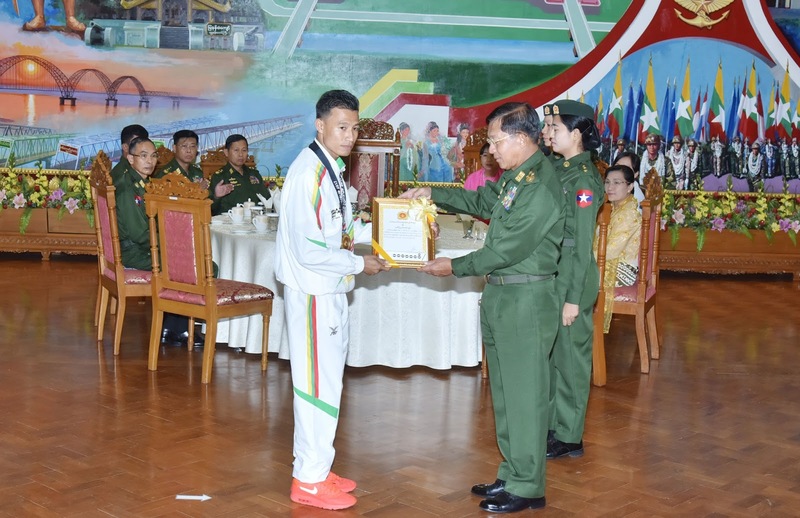 Afterwards, Senior General Min Aung Hlaing presented certificates of honour and cash awards to Ma Myat Thet Su Wai Phyo on behalf of the team which won two gold medals in the Wushu competition of the 29th SEA Games, Sergeant Thant Zin Oo on behalf of the team which won two golds in the Sepak Takraw contest (men’s double and four-member women’s event) and Maung Kyaw Soe Moe on behalf of the team which won two golds in the Chinlon contest (men’s event 2 and event 4). 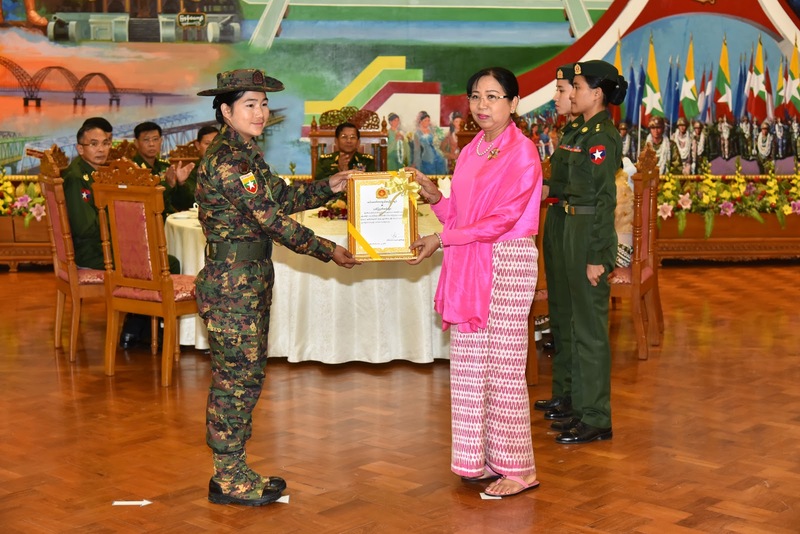 The Senior General’s wife Daw Kyu Kyu Hla presented certificates of honour and cash awards to Ma May Po Wah who won gold in 10-metre pistol shooting contest in the 29th SEA Games and Warrant Officer Nan Yu Wah Hlaing on behalf of the Tatmadaw team who won gold in women’s pistol shooting contest in the 26th AARM shooting contest. Vice-Senior General Soe Win presented certificates of honour and cash awards to the respective teams who won two silvers in Wushu competition, who won two silvers in Sepak Takraw contest (men’s double and four-member event), who won three silvers in billiards/snooker (9-ball/billiards), who won silver in Judo contest (women’s 78 kilos) and who won silver in archery contest (compound-mixed team). Then, Chief of the General Staff (Army, Navy and Air) General Mya Tun Oo presented certificates of honour and cash awards to respective athletes for winning one silver in Hockey (team-wise) event, one silver in men’s rifle shooting contest of AARM, two bronzes in Wushu contest, one bronze in Sepak Takraw (women’s double) and three bronzes in individuals’ shooting (10-metre air pistol, optional pistol and 50-metre rifle); Commander-in-Chief (Air) General Khin Aung Myint to respective athletes for winning three bronzes in individual billiards/snooker, four bronzes in Karatedo (men’s under 54 kilos, women’s under 49 kilos and men’s and wome’s individuals) and one bronze in track and field (women’s 800 metres); and Adjutant General Lt-Gen Hsan Oo to respective athletes for winning one bronze in weightlifting (62 kilos), one bronze in women’s volleyball event, one bronze in women’s football tournament, one bronze in men’s carbine shooting contest and eight golds, 11 silvers and 21 bronzes in the shooting contests of the 29th SEA Games and 26th AARM. On behalf the victorious athletes, Ma Myat Thet Su Wai Phyo and Nan Yu Wah Hlaing spoke words of thanks. After a tea party, the Senior General and party cordially greeted those present at the ceremony.